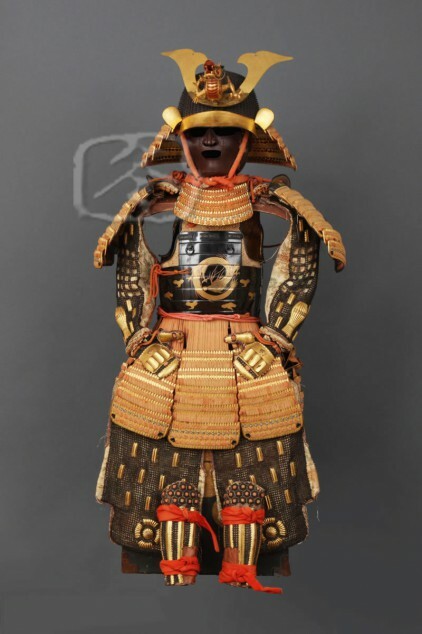 ＃AR207　RUSSET IRON ‘UCHIDASHI GO-MAI DOU GUSOKU. Second Half Of Edo Period. This armour is composed of a thirty two plate russet iron helmet bowl. 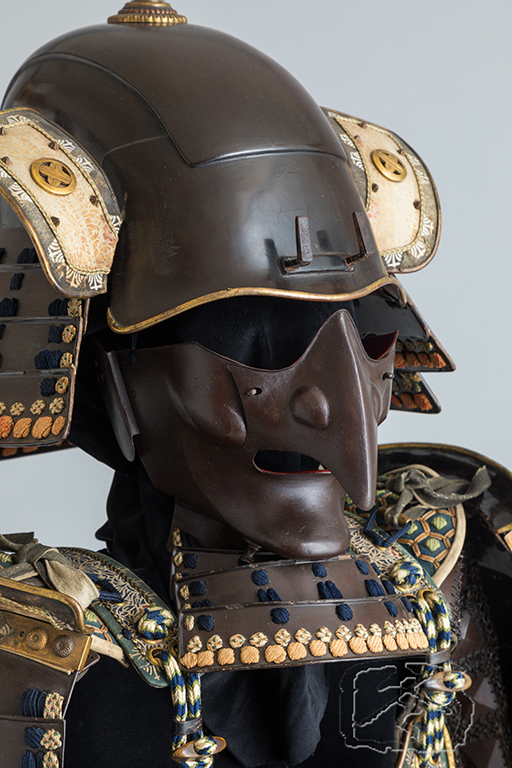 The ‘tehen kanagu’ (fitting around the hole at the top of the helmet) is made up of five tiers of mixed soft metals in a floral shape. 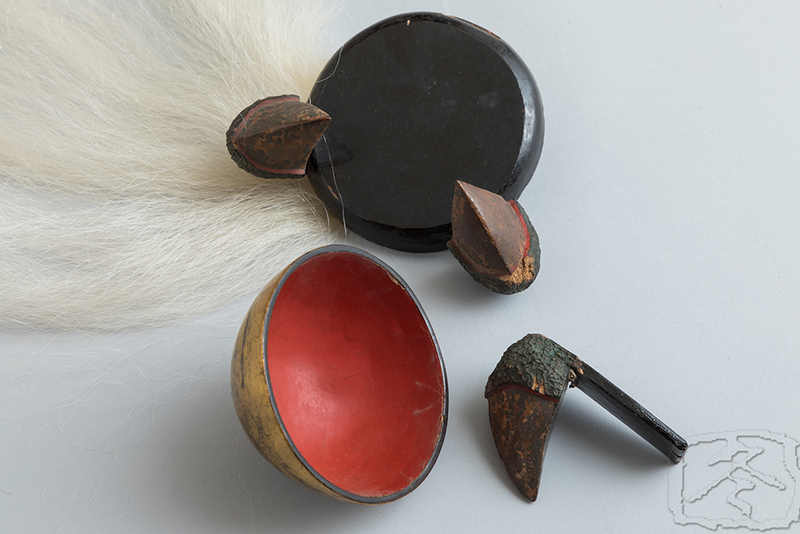 The lacquered and gilded ‘maedate’ (decoration) is in the form of a dragon claw holding a treasure with a white yak hair application flowing over the helmet. One of the claws can be removed, releasing the gilded wood treasure which in turn can be used as a cup. 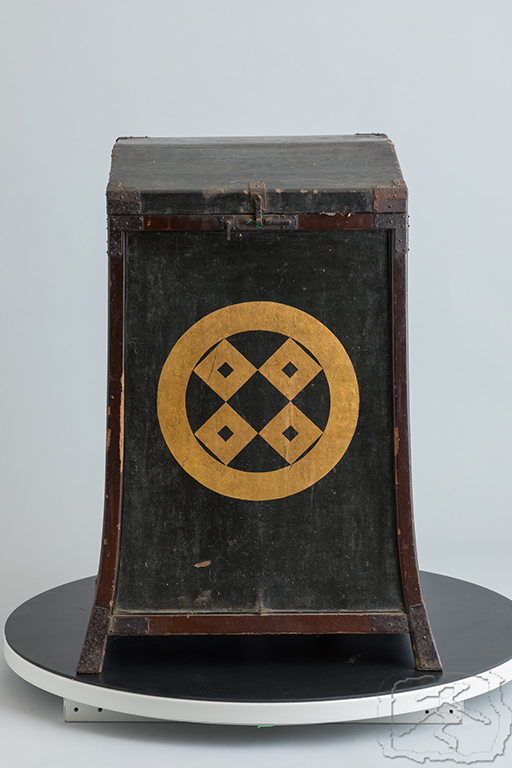 The ‘fukigaeshi’ (turn backs) are trimmed with gilded copper in rope form, with heraldry of what is most likely a branch of the Kyogoku clan of Inaba, Toyo-oka han. 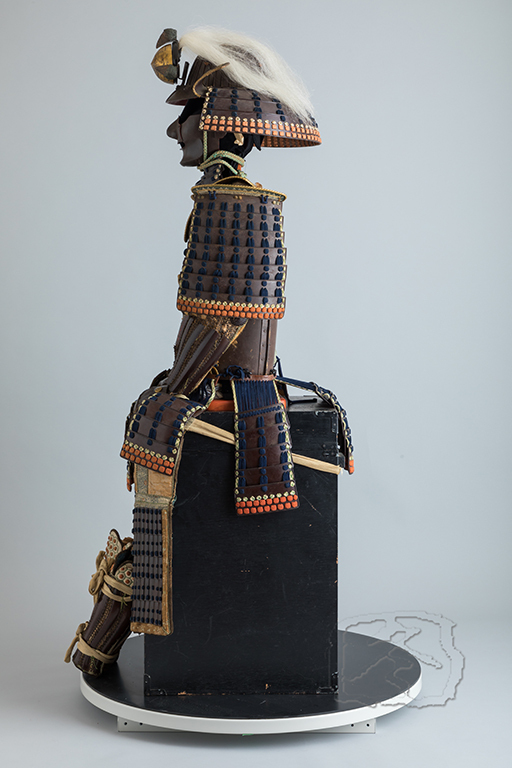 The ‘manju shikoro’ (rounded neck guard) is made of four lames of lacquered iron plate held with ‘sugake’ (wide spaced) navy blue silk lacing. 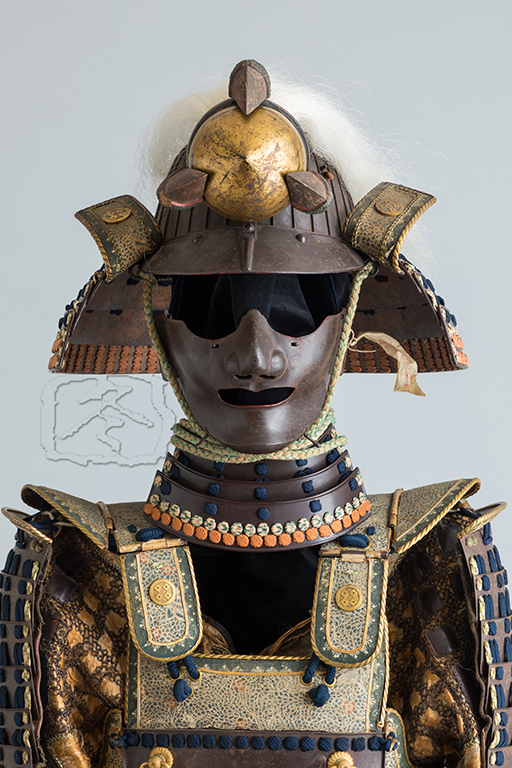 The russet iron ‘ryubu men’ (mask of noble expression) is characterized with smooth rounded cheeks, small removable nose and a mouth which reveals no teeth. The ears are carved with small ‘inome’ (heart shapes). The large elongated pins on the chin prevent slippage of the helmet cords. The interior of the mask is lacquered red. The ‘tare’ (throat guard) is made of four lames of lacquered iron plate. 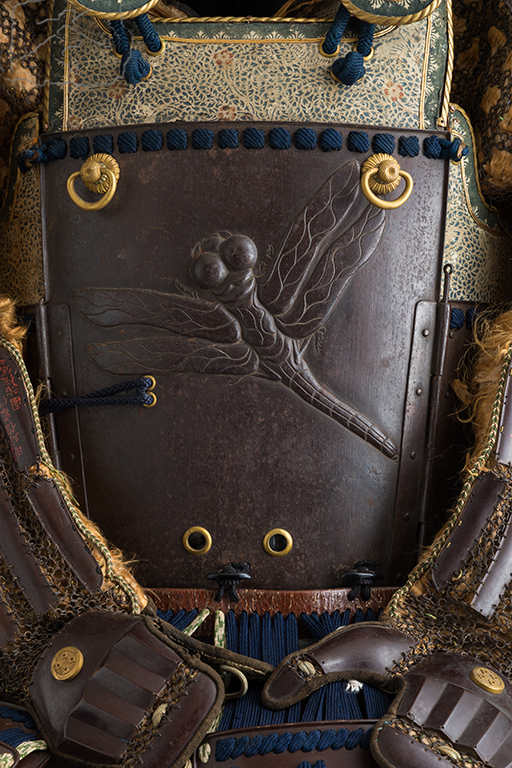 The russet iron ‘gomai dou’ (cuirasse made of five hinged plates) is decorated on the breast plate with an embossed dragonfly. Dragonflies were a symbol favoured by the samurai class for their strength and tenacity, willing to attack prey far larger than themselves. 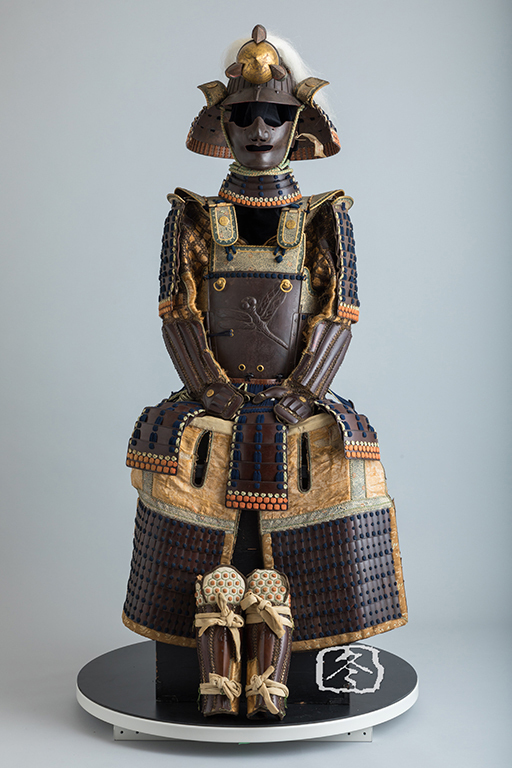 The ‘muna-ita’, ‘waki-ita’, and ‘seno-ita’ (upper parts of the cuirasse) as well as the ‘gyoyo’ are mounted with stenciled doe skin and trimmed with rope-like gilded copper. 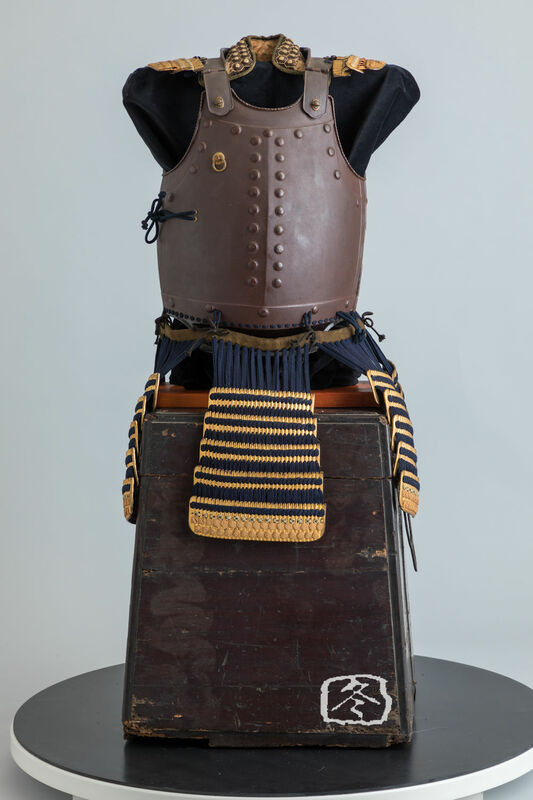 Due to the considerable weight of this cuirasse, it has been made in ‘renshaku’ style whereby cords are passed over the shoulders on the inside and passed through the two holes at the bottom of the breast plate which shifts some of the weight from the shoulders to the waist. 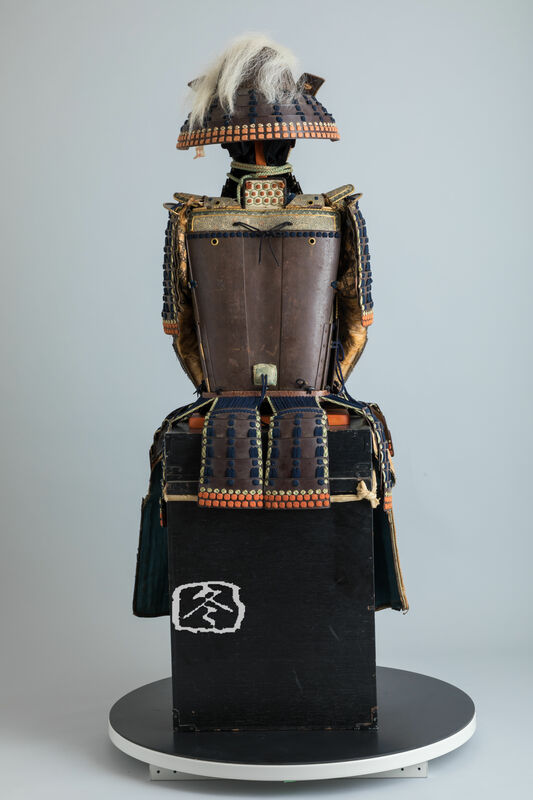 The ‘kusazuri’ (skirt) is made up of seven divisions of lacquered iron plate each of five lames. 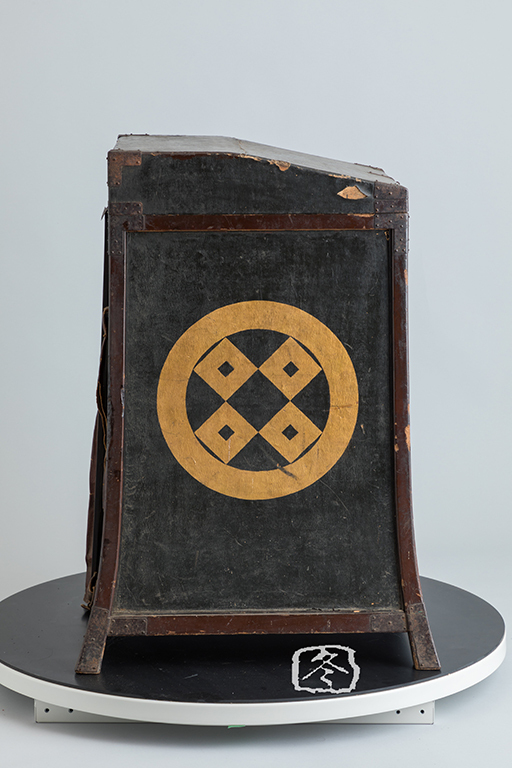 The ‘hiro sode’ (flared shoulder guards) are made of seven lames of russet iron, and are dressed with the same stenciled doeskin and gilded copper rope mounts. 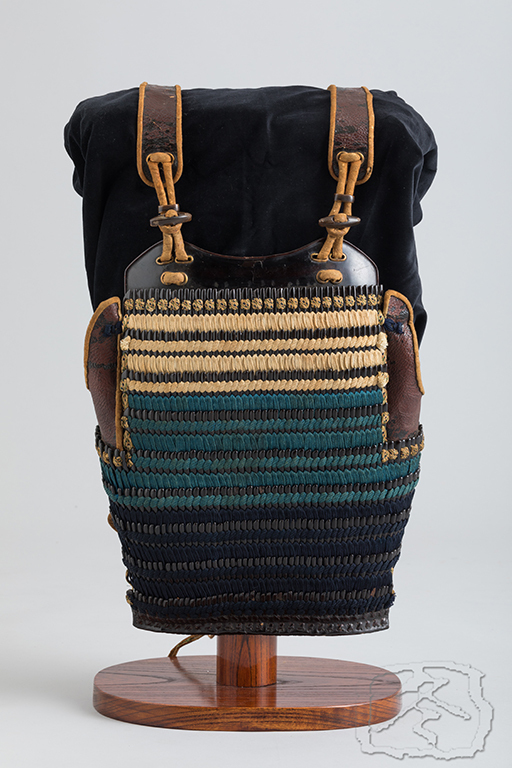 The ‘shino gote’ (sleeves) are made of lacquered strips of iron, secured with chainmail. They are interesting in that the inner most strip of each is hinged to allow that little more flexibility and movement. 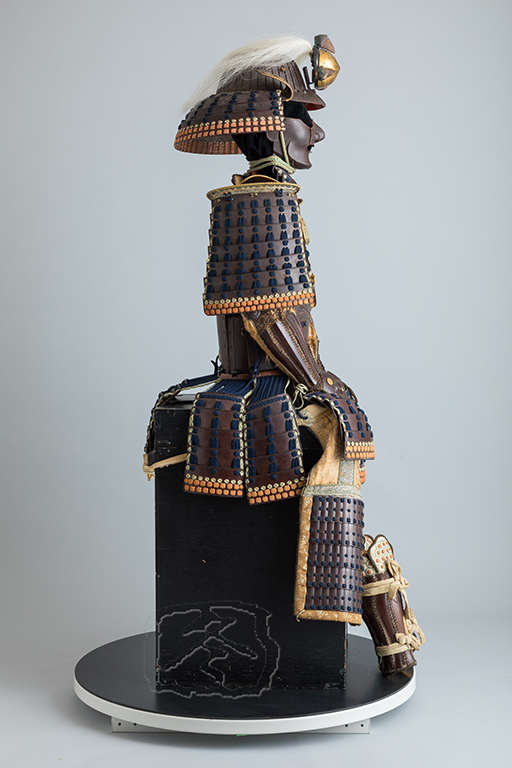 The back of the‘kou’ (hands) are mounted with gilded copper heraldry. 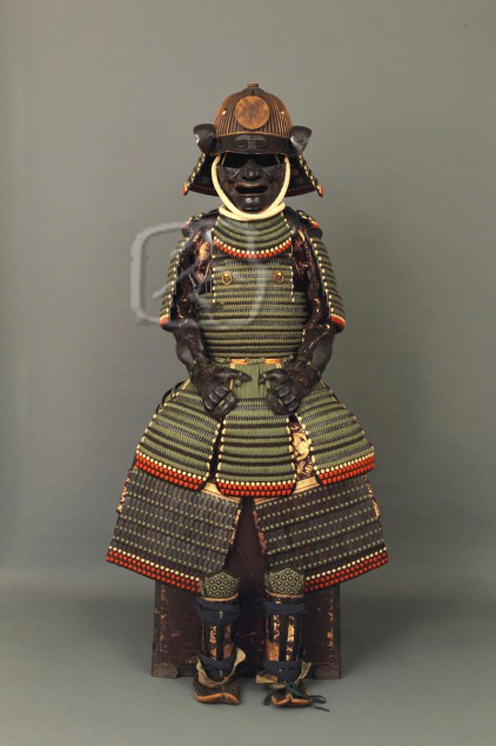 The lacquered iron ‘kawara haidate’ (thigh guards) are of over lapping roof tile design. 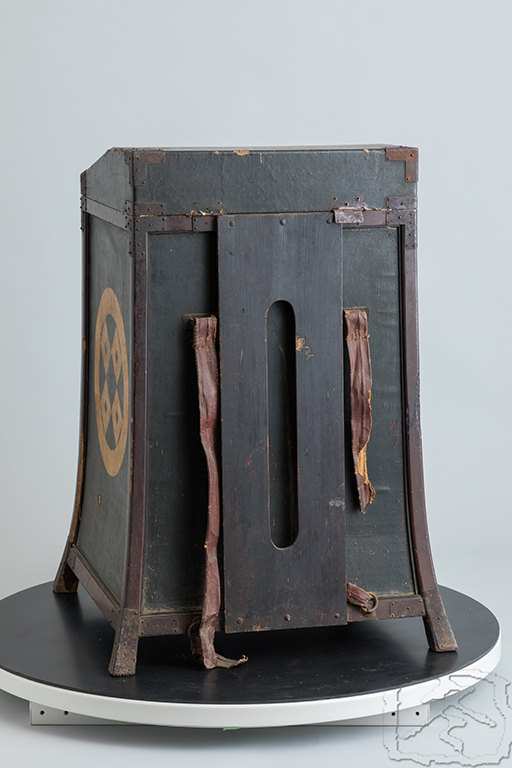 The ‘shino suneate’ (shin guards) are also made of lacquered iron in the same style as the ‘kote’. 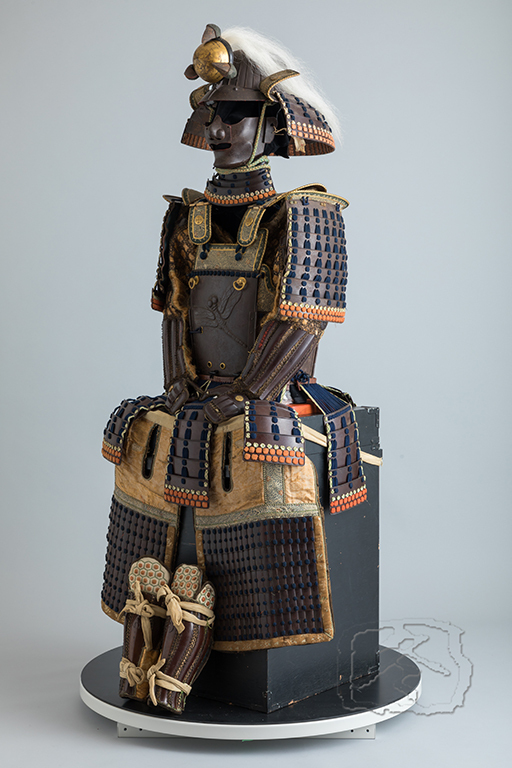 This armour is housed in a ‘seoibitsu’. Designed to be carried on one’s back. Fragments of the shoulder straps still remain. The top is gently sloping to allow rain to run off. It is decorated on three sides with gilded heraldry consistent throughout the armour.